Accordion only (but my digital accordion has – kind of – flute, clarinet, saxophones, organ, mandolin, piano, bass, etc.). Began playing accordion at age 8 (parents wanted me to play piano since we already had one, but because my older brother was doing that I would have nothing to do with it!). Took lessons at the Chinisci School of Music through high school and taught there the last two years of high school and during college at UNM (music theory/composition major). Went to University of Missouri at KC and studied there for one year. 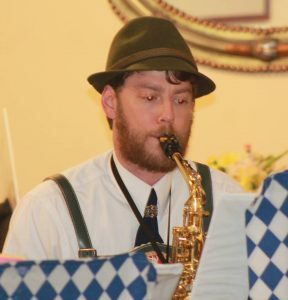 Got into Die Polka Schlingel as a substitute for what was supposed to be a one-time gig. I have been here for 42 years now. Also serve as the leader of the Albuquerque Accordion Club. Impossible to narrow it down too much, but I love Bach keyboard music, especially “The Little Fugue in G Minor” and Mozart’s “Overture to the Magic Flute”. Those two are mostly because, along with a partner in crime, I’ve played them as accordion duets. Challinging, but great fun! “A fugue is a compostion in which the voices enter one at a time… and the audience leaves in the same manner”. BIG PRINT GIVETH. small print taketh away. “Eschew Obfuscation”. 2nd favorite bumper sticker is (This is on a red sticker with white lettering) “If this sticker is Blue, you are driving too Fast”. Reading, photography, going for a walk. 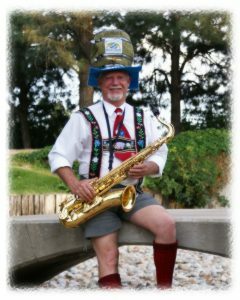 First played in a polka band when I was a junior in high school. I’ve been playing ever since. I have been playing with this group for over 34 years now. Marching band in High School (got to go on a field trip with my first crush). Eat peanut butter and crackers before playing. I don’t have a favorite, I like it all. What are three things that are always in your music case? If you weren’t playing an instrument, what would you be doing? Probably sitting in jail for doing something I shouldn’t have. Radio, harmonica, drums, violin, red clarinets, trombone, mexican marimba, spoons. Playing a christmas gig in the Alb. airport and cuing myself from a persons expletive everytime they missed their part, which was exactly the same measure. Then at the airport, they played it right and i missed my part, meaning i used the expletive, too late. Suppose you were an idiot. Now suppose you were a member of congress.. Sticks, drum key, pencil, aspirin, band aids, felt pads. Playing with my dog or finding a really bad “B” movie. 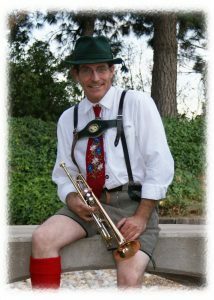 Playing professionally for over 35 years, various instruments. Private Music Teacher/ Band Director for 8 years. Use it for a beer stien (at least not again). Way too difficult to pick just one, how about some artist ….. lets start with: Mozart’s Requiem Mass, Count Basie, Duke Ellington, ABBA, Led Zeppelin, Queen, Emily Autumn, Weird Al Yankovic, …. (I’m exhausted just trying to think of them all). My instruments….. at least I hope so…. Solving the problems of the known universe, … while watching South Park. 3rd grade: euphonium, 7th grade switched to tuba and never looked back. Been a member of many brass quintets, bands and orchestras. Became a band director 12 years ago. 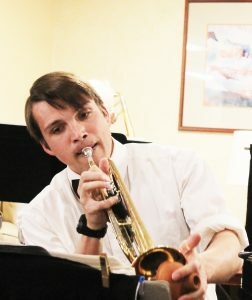 Performing with my brass quintet for the Empire Brass in Boston. Ride a motorcycle with it strapped on your back. Valve oil, slide grease, clothes pin pieces. Watching Top Gear or any old Sci Fi movie. When I was 8 or 9, my babysitter could play Suicide is Painless (theme song to MASH) on her clarinet. I was hooked; started playing in the fourth grade and except for a brief stint as a nuclear physics major (my parents wanted me to have a “more lucrative career” than music could provide). I’ve never looked back. 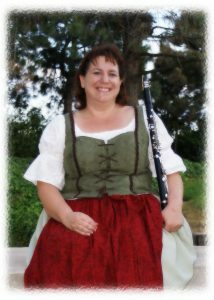 Now I play with the DPS (dirndl required on the German gigs), the NMTBB (Civil War era uniform required), and a Baroque recorder ensemble (corset required). When I grow up, I want to play gigs where I can wear a black dress, just a simple black dress. To listen to, to play, to conduct? What’s the occasion? What mood am I in? Is the moon full? How could I possibly choose? But once, I was listening to Dvorak’s 9th Symphony while driving to work. Got to the end of the first movement and realized I’d driven several blocks past my school. Turned around, and drove past the school a second time. I don’t listen to music in the car anymore! Reeds, all the reeds, so very many reeds…..
My first paid gig performing with a local jazz band. Perform it for an undeserving crowd (my cats and dogs for example). The Eternal Triangle performed by Dizzy Gilespie, Sonny Stitt, and Sonny Rollins. My instrument, a reed and delusion. Listening to music, hanging our with my family or creating and then procrastinating on another home project. 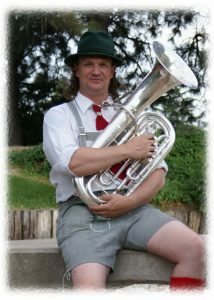 Erste Tuba. A new way of thinking about heavy metal. Also, have violin, trumpet, trombone, euphonium, clarinet, sax, cello, and bass guitar. Taught music in Albuquerque Public Schools. Past schools I have taught at are Zuni, Cochiti, Santa Domingo, Bernalillo, Fort Diafiance, and Santa Fe. 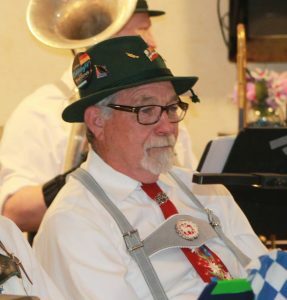 Lifelong musician – barbershop harmony singer, horn blower, piano banger-upon. Winning my first barbershop harmony contest. Got started at the Hummingbird Music Camp in 2nd grade on the Trumpet, and then learned how to actually play in Undergrad at UNM. Playing Euphorium at a Tuba Convention while wearing a big “I Trumpet” shirt. I got nothing but confused and irritated scowls. Pencils, Extra Pencils, extra mouthpiece, and extra backup Mouthpiece. Probably thinking about learning an instrument or making another pot of coffee.